Welcome back to Laundry School! This week, as promised, I’m taking your questions about the products that we use in our laundry, with a focus today more on dryer and drying-related products than last week’s lesson, which was more washer-focused, centering on detergents and boosters. Longtime readers and, um, anyone who reads the headline of this post know that this will mostly be an exercise in working out my feelings about fabric softener. But before we get into that, there were some very good questions about the use of those protective mesh baggies that go into both the washer and the dryer, depending on their contents, and about at-home dry cleaning kits. So we’ll tackle those first, and then I’ll work myself into a blind fury on the subject of fabric softener. It’ll be great. Let’s get started. My girlfriend thinks I’m a smart, wonderful person (handsome, too! ), yet I’m not allowed to touch her clothes come washing time (mildly annoying). She thinks I don’t know how or when to use the mesh bags to protect delicate items, and that I’ll ruin her dainties! I’ve set ego aside to ask you, the expert, to help a feller out! How do I use those strange mesh bags to protect clothing? In the washer? Dryer only? Follow-up question: I’ve noticed that the items often come out of the bag wrinkled. Any tricks to ensure that sweaters and pants are wrinkle-free when using the mesh bags? Well, wait. You can’t actually be expected to know exactly which of your girlfriend’s belongings she wants washed in those little mesh baggies, can you? That’s a bit much. But that wasn’t actually your question, so let’s move this right along. Though, I suppose we should start with a quick overview of why one would want to use those little mesh baggies. (This thing, for the uninitiated, is what we’re talking about.) You mentioned delicates, and yes, a lady’s dainties (the fancier underpants, bras, and other lingerie-y type things, as well as finer fibers like cashmere or embellished items) are often washed in those bags to prevent them from getting banged up or stretched out from contact with bulkier garments in both the washer and the dryer. They’re also helpful when it comes to items, like bras, that are often washed in the machine, but not put into the dryer—it’s handy to be able to just pull that easily identifiable bag out of the drum and set it aside before putting the rest of the wash into the dryer. So that answers part of your question, which is that yes, those bags can go in both the washer and the dryer. As for the wrinkles, I suspect the problem is stemming from the bag not being big enough to allow the garment to move about. You mentioned pants, which are not generally the kind of thing that go in those little mesh baggies, though I’m sure there are instances in which a pair of pants might be a contender for the baggie treatment. I have that bag that claims you can use it to dry clean clothes in your dryer. My inkling is that this isn’t a full replacement for dry cleaning, so every once in a while I still take my dry-clean clothes to the cleaners. What are your thoughts? Years ago, when these things were introduced, I tried Dryel, which is one of the more popular brands of at-home dry-cleaning kits. I hated it because it left behind a sort of Febreze-y scent that I found cloying over time — it seemed nice when pulling items out of the dryer, but once the garment was on me, the smell started to become bothersome. Making matters worse was the fact that that scent was layered on top of whatever odors (BO, cigarette smoke, stale beer, whatever) lingered in the clothes. So I pitched the at-home dry-cleaning kit and never looked back. But that was a long time ago, and it is, of course, entirely possible that the technology has improved since then. A little digging around turned up this New York magazine piece from a few years ago, in which the author tested three different kits. She found that they all pretty much sucked. Jolie, my sister insists that fabric softener is actually bad for your clothes. Your thoughts? My thoughts are this: Fabric softener is terrible, and I want everyone to stop using it. I’m going to tell you why I feel that way, but first, I want to reiterate something that I said in the Cleancast episode on pit stains (featuring Deadspin’s very own Greg Howard). I try, in this column, not to take too hard a line on things, because I believe that everyone here is an adult who can make his or her own decisions about why and how and what products to use in their life (and in their laundry). I also feel strongly that taking a hard line is not the best way for me to do my job, in that the hard line doesn’t allow for nuances and differences in our homes, our belongings, our available time and/or money, and so on. Given that, if you use liquid fabric softener or dryer sheets, and you feel attached to them, by all means keep using them. I’m not a dictator; I’m an advice columnist. And that’s just how I like it. With that said, here’s the reason I’d prefer to get you all off the fabric softener: It leaves behind a coating that, over time, will render the fibers of your clothes more impenetrable to water and detergent. That coating will cause different things to happen to different types of fabrics; in the case of especially funky-smelling clothes, like gym gear, it will, over time, lock in that kind of crotch-y, sweaty smell. Towels are another category that don’t respond well to fabric softener; the coating I mentioned will make the towels less absorbent. Which is, you know, kind of contrary to the whole idea of towels. I’ve heard a rumor that the fibers of terrycloth towels are damaged by most detergents, making them coarse and less absorptive, and therefore they should be washed alone in cold water with Woolite (or no detergent at all), then tumble- or air-dried. Can you confirm or deny this rumor? I can deny this rumor. It sounds like whoever you’ve been playing telephone with just garbled the message: It’s fabric softener, as you just learned, that’s to be avoided in the laundering of towels. What do dryer balls REALLY do, and are those felt-ball things effective at all? Oh, I love a dryer ball so very, very much. I don’t love all dryer balls equally, but as a category of laundering products, I am pro. Here’s what they do: They bounce around in the dryer, alongside your clothes or sheets or towels, and help to fluff those things up by creating better air circulation and decreasing drying time, preventing fabric clumping (like when a fitted sheet wraps itself around all the rest of the stuff you’re trying to dry), and, in the case of filled items like comforters or puffer vests, helping to redistribute stuffing evenly. You can buy rubber dryer balls, or the felt ones you mentioned in your question. You can also use a pair of tennis balls, or even a clean sneaker. Some people choose to wrap the sneaker or tennis balls in an old sock, and that’s a good choice, too, as it will help to cut down a bit on the racket and protect your clothes from possible dye transfer. Do you believe in dryer sheets to cut down on static? Dryer installers told me to never use a full sheet, but the half sheets tend to get caught in the lint filter. Ah, static. This is the one place where I have to admit that dryer sheets offer an advantage over dryer balls and/or white vinegar. The sheets really are just better at eliminating the static that is so often created in the dryer. How’s that for some honesty that flies right in the face of the anti-fabric softener agenda I’ve been pushing on you? I still don’t think you should use dryer sheets, but if static is a thing that makes you C R A Z Y, then I want you to be aware that cutting out the sheets may feel like a huge mistake to you. Maybe try doing a load without the sheets and see how things go, and then make a decision? Also, try this: You can easily remove static from fabric by rubbing it against something metal. If you do your wash in a place that has metal wire laundry carts, those work just great for this purpose. Laundry School, I need you. Fabric softener 101, please. I’ve only ever used dryer sheets in the past, but I don’t even use those anymore, just out of sheer laziness. I’m worried I’m missing out on something basic and/or amazing. Should I be using it during the wash cycle instead? I have a front-load washer with the drawer for detergent, and there’s a spot for the liquid fabric softener. Do I add it at the beginning when I’m loading the washer and I add the detergent? Or am I supposed to do it sometime in the middle of the cycle? Are there certain fabrics/items that I would see some real benefit to using it? Is this one of those things that changes with the quality/hardness of your water? Help! You’re not missing out on anything amazing and I would really prefer you not take up a liquid-fabric-softener habit, but if you do, the stuff goes in during the rinse cycle. If the machine you’re using has a fabric-softener compartment, put the stuff in there at the start of the wash. and it will be released at the appropriate time. But really, just don’t use it. 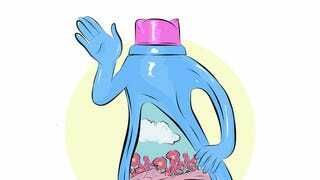 Liquid fabric softener, in addition to not being great on your clothes, is also not great for your washing machine, as it can lead to product buildup. And, over time, that build-up is going to cause staining, as one reader recently learned. Oh Uh-Huh, You Need To Wash Your Makeup Brushes. Here&apos;s How.